As Americans take to the polls next month, the presidential candidates and Congress continue to debate policies on energy, the environment, and science education and funding. Gas prices, oil drilling and alternative energy  all are major players in the races for 34 seats and majority control in the Senate. Afghanistan Redux: Better Late than Never? As the war rubble clears, scientists are working to help the people of Afghanistan rebuild their country. The new national education law is having unexpected consequences for teaching science in K-12. A little sodium plus a steel ball and a lot of ingenuity may produce a lab-grown geodynamo for better understanding Earths magnetic field. Geologic mapping data are useful in everything from homeland security to devising crop rotations. An igneous petrologist leaves her research behind to pursue science policy in Washington, D.C.
One metal helped save his life, the other helped make him a champion. Movies: Baffling flash-frozen science Plus a Web exclusive! Left: Democratic presidential candidate Sen. John Kerry (D-Mass.) speaks at the New Jersey AFL-CIO's 26th Constitutional Convention at Bally's Atlantic City on June 15. Photo by Nicholas Roberts/AFP/Getty Images. Right: President George W. Bush speaks to a gathering of the American Conservative Union at the J.W. Marriott Hotel in Washington, D.C., on May 13. Photo by Spencer Platt/Getty Images. 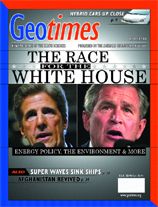 Read about the candidates views on key geoscience issues. Upper right: Photo of Toyota Prius is courtesy of Toyota. See story.